The Olympic Channel features a video that recalls images and moments from the 2016 Rio Olympics. Entitled “Games to Remember – Re-Experience Rio 2016: The Official Summary of the Rio2016 Olympic Games,” the video runs over 37 minutes long. I started it, but was only going to watch it for a few minutes. I ended up watching the entire video, a collection of short clips of the events of each of the 16 days. And they are all stunning! Slow mo, normal speed, tracking shots, overhead shots, long shots, all edited to highlight the aesthetics of epic poetry in motion, to accentuate the limits to which the athletes will stretch themselves, to remind us of the chills we experienced when viewing the very best in the world achieve the highest levels of physical achievement. Go to this link. If you can, put it up on your big flatscreen TV. And revisit the joy of the 2016 Rio Olympics. There be gold in them thar phones! If you’re living in Japan, and you buy smartphones like you buy a fashionable spring jacket, then you’ve got a bunch of phones in your cabinet that are just gathering dust. Tokyo2020 wants your phone! Starting April, Japan telecommunications conglomerate, NTT Docomo, will set up collection boxes in over 2,400 NTT Docomo stores across Japan. Additionally, the Japan Environmental Sanitation Center, will also set up collection centers to collect old PCs, tablets, wearables, monitors, and other electronic devices that can be mined for metals. The goal is to collect 8 tons of metal, which will yield 2 tons of gold, silver and bronze, and eventually result in the production of 5,000 medals for winners in the Tokyo 2020 Olympic and Paralympic Games. Sustainability will be a key theme of Tokyo2020. And my hope and expectation is that Tokyo2020 will be a shining model of how to present the Olympics, as it was in 1964. Tokyo2020 will stand in stark contrast to past Olympics. For example, there are already signs of decay in Rio de Janeiro as venues used for the 2016 Rio Olympics have been abandoned. This is an oft-told tale, with plenty of photographic evidence of waste from past Olympics. Only six months later, the main venue for the Rio Olympics is an empty, pilfered and unused shell of a stadium. The IOC knows its reputation and perhaps its long-term survival are dependent upon making the Olympics more in line with the host country’s economic plans and means, and more conscious of its obligations to be more socially tolerant and more purposeful in driving sustainability. Since its inception in 2014, IOC President, Thomas Bach, has driven home the 40 tenets of his vision – The Olympic 2020 Agenda – a list of priorities, principles and actions that will guide the IOC in the coming years. Some of the hopes is to help ensure that host cities do not end up with an overly burdensome budget to hold the Games, to make the bidding process less complicated and less expensive, to ensure non-discrimination on the basis of sexual orientation, and to drive greater sustainability. The IOC has been working closely with Tokyo2020 to bring its operational budget down from USD30 billion, which is four times the budget put forth in the 2013 bid for 2020. The current goal is to get the budget down to under USD20 billion, which is far under Sochi’s USD50 billion spend, Beijing’s USD40 billion spend, and more in line with London’s USD20 billion spend. I believe that Tokyo Governor Yuriko Koike is making an honest attempt to drive the budget down, as well as create a legacy of sustainability and inclusiveness in Japan. If you’re in Japan, you too can help! Look for your old smartphones, and the signs at NTT Docomo. Donate a phone, and ensure that a piece of your property becomes a piece of the winning medal for Olympians in 2020. 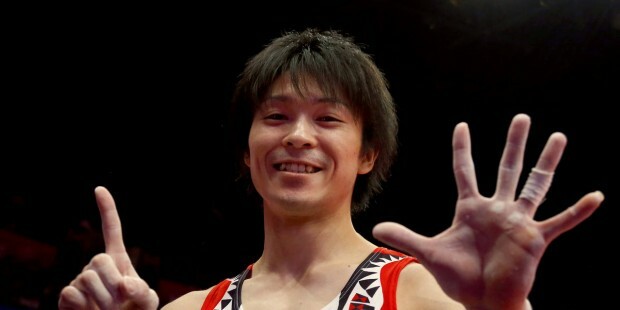 At the 2015 World Gymnastics Championships in Glasgow, Scotland, after the competition ended, Kōhei Uchimura beamed into the camera and raised one finger at a time, until he showed the world six fingers, one for six consecutive world championships since 2009. Actually, it’s seven if you include the 2012 London Olympics. In fact, he is the only gymnast, either male or female, who has ever won more than two world championships in a row. There have been gymnasts who have won more medals, and those who claimed more golds. But no one – no one – has dominated like Uchimura or done it for so long. That just doesn’t happen in gymnastics, where the difficulty of the skills and the constant repetition required to perfect them means the best gymnasts have all the staying power of a Kardashian marriage. It’s simply too grueling to stay at the very top for more than one Olympic cycle. Beauty of movement is my goal. My father used to say that a hundred imperfect movements cannot match a single beautiful one, and this is something I have always kept in my mind. I could perform more difficult skills, but if I did I would have problems. For instance, I don’t have the energy that I did, and I can’t keep my feet taut, so I always aim for a balance between technical difficulty and execution in my routines. This is where the beauty of gymnastics comes in. At the ripe age of 27, the Kita Kyushu native believes he is peaking at the right time for Rio, and that this is the last chance for him to maintain this level for all-around competitions, although he does leave open the possibility, as he says in the FIG interview, of competing for Japan at home in the 2020 Tokyo Olympics. The Rio Olympics will probably be the last when I am at the top of my game. I want to be faultless. As the 2020 Olympics are being held in Japan, I want to carry on until then. [But] the risk of injury increases with age. One can carry on competing on the horizontal [high] bar for longer than the other apparatus. My technique is good, and I’m capable of scoring highly, so I would choose the horizontal bar. The question is, can he lead the Japan team to its first overall gold championships since 2004, and perhaps spark another golden age of Japan’s men’s gymnastics when they won gold at six consecutive Olympics from 1960 to 1976. Uchimura will have London Olympic teammate, Koji Yamamoto, Ryohei Kato and Yusuke Tanaka, as well as a 19-year-old talent, Kenzo Shirai, who is a world champion in the floor exercise. But there is no question: Unless Uchimura has an injury in Rio, there is very little stopping Superman from repeating as Overall Champion at the Olympics this summer. The headquarters of sports fitness company, Konami Sports, is in the same building complex as my company, and I was happy to see the above poster featuring three members of the Japanese Men’s gymnastics team, who also happen to be Konami employees: Yusuke Tanaka, Koji Yamamuro and Kohei Uchimura (内村 航平, )who won gold in the World Gymnastics Championships in Glasgow on October 28, 2015. There was a time from 1960 to 1978 when Japan’s men dominated, taking team gold in five straight Olympics, as well as five straight World Gymnastics Championships. They finally re-claimed Olympic gold in 2000 and 2004 but had not won in the World Championships since 1978…until Wednesday. And this weekend, we find out if Uchimura, arguably the greatest men’s gymnast ever, will win gold in the men’s all around, again, as he has done since 2009. Since then he has won gold in London, Rotterdam, Tokyo, Antwerp and Nanning, including gold in the 2012 London Olympics. No one has ever come close in excellence and sustainability. Can he make it six straight as the very best men’s gymnasts in the world? Watch him in his floor exercise at the 2014 World Gymnastics Championships. Perfection.